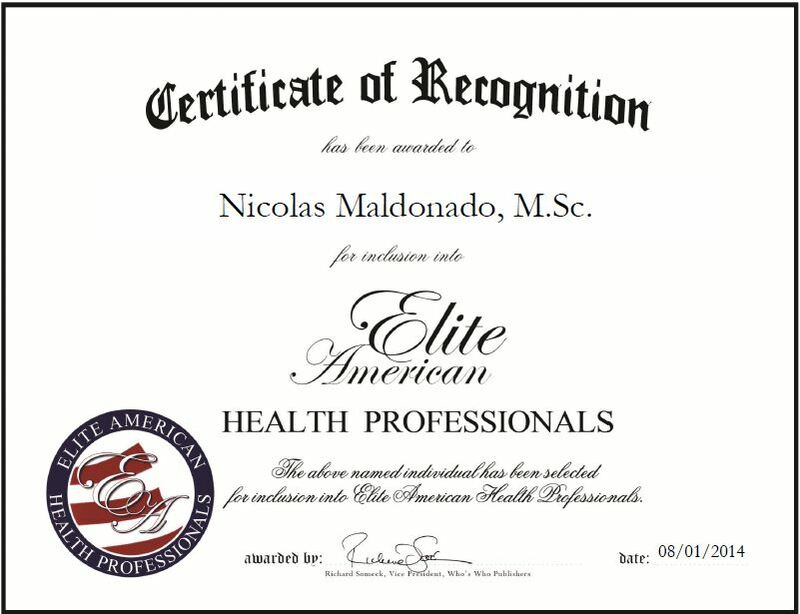 California, August 1, 2014, Nicolas Maldonado, M.Sc., Director of Global Quality Systems and Compliance at Abbott Diabetes Care, has been recognized by Elite American Health Professionals for dedication, achievements and leadership in quality and compliance. Mr. Maldonado has been with Abbott Diabetes Care his entire professional life. He has garnered 24 years of experience in immunodiagnostics, pharma and medical devices, and has become an integral member of the company’s success. In his current capacity, he is tasked with ensuring in a specific way that the organization is in alignment with diabetes care, making sure diabetes care has state-of-the-art quality systems for all documentation, training and activity execution, supporting clinical trials, overseeing research and development up to commercial marketing, overseeing a staff of 32 people across the world, and hiring, training, managing and mentoring employees. He also creates development learning material. Identifies available learning material to bring in, and facilities the system for new product training to be given to the right personnel. Mr. Maldonado has held leadership roles in Puerto Rico, the U.S. and Europe. He is known for his skills in global compliance, quality systems, training and instructional design, change control, and strategic organizational alignment. He has also gained a strong reputation for his forward thinking, his concentration on work strategy and always thinking of new methods. When dealing with issues, he moves quickly to solve it straight forward and move on. He doesn’t dwell on the issue, but the solution. Throughout his career, Mr. Maldonado has achieved the development of the business in Europe, NW Africa and Russia through his previous position in Europe, while Director, Regional Quality Operations for Abbott Global Pharmaceutical Operations. He started working in operations as a technical support person in his early days at Abbott. Most of his life he led operations quality in order to learn about quality systems and execution of compliant operations. Mr. Maldonado attributes his success to his hard work and dedication, as well as his ability to translate the division of an organization into tactical actions and goals. In the coming years, he would like to hold an executive position that could help him use everything he has learned in guiding the company through strategic moves. This entry was posted in Product Development and tagged compliance, diabetes, immunodiagnostics, medical devices, training. Bookmark the permalink.